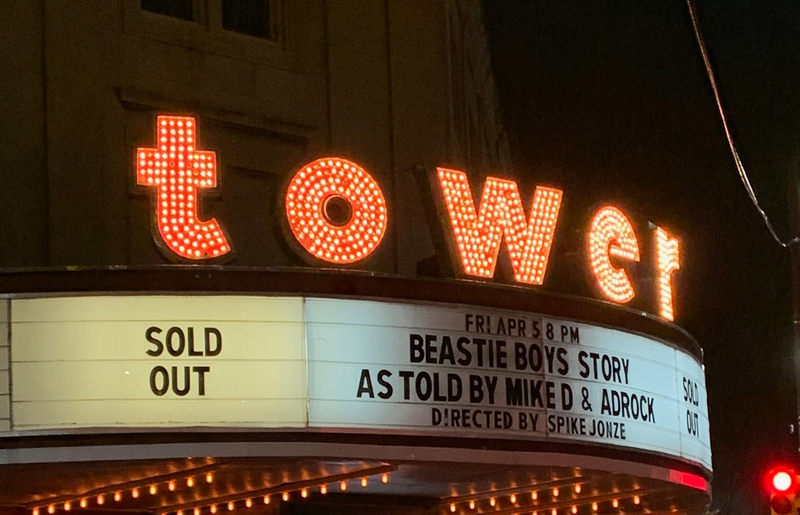 I walked into the performance of “Beastie Boys Story” virtually blind along with the rest of the sold-out crowd at the Tower Theater in Upper Darby on Friday, April 5th. However, the act of walking in was just the beginning of our adventure. When I purchased the ticket with less than 24 hours’ notice of the announcement of this two city, three date tour back in March, (I’m still shocked that Philly was included), Ticketmaster said that it was starting at 8 p.m. sharp. Late arrivals would only be permitted in with the discretion of the theater. I joined the 3,000+ capacity crowd in the rain around 7:30 p.m. only to wait in a line that rivaled airport security on a holiday weekend. However, the security wasn’t due to any kind of terrorist threat. It was because director, Spike Jonze, of the ‘Sabotage” video and Being John Malkovich fame, was filming a movie, and the two tractor trailers set up next to the theater provided proof. Ticketmaster also sent e-mails out that our phones and smart watches would all be locked in personal magnetic pouches to prevent anyone from filming or taking pictures. So, it took until 9:00 p.m. to allow the Gen X crowd to be situated in the theater. I went into the show without any expectations, assuming it would wrap up in two hours or less. The performance was billed as the filming of a movie about the Beastie Boys Book which was released in Fall 2018. I thought, at first, that it would be some kind of musical, like Green Day’s American Idiot stage production. But it included the remaining members, Adam Horovitz (Ad-Rock) and Michael Diamond (Mike D). The performance was a two-man show, now that the trio has been reduced to a duo with the passing of Adam Yauch (MCA) in 2012 due to cancer at the young age of 47. Horovitz, who seemed more like the lead spokesman for the evening, and Diamond shared all kinds of crazy vignettes about Yauch and his practical jokes as well as his growth that led to international fundraising for the people of Tibet. The love that these two have for each other shined through with each chapter of evening. Diamond and Horovitz had vowed to never perform again after the passing of Yauch. Even though they didn’t actually sing, the night was filled with an abundance of clips of their music and phenomenal visuals on a stage-sized video wall filled with photos and videos dating back to their early teens when the trio first met. As they discussed their teen years, you realized that they were just a group of misfit kids who were getting into a new genre of music; punk and later rap, before it was accessible for the masses. One minute they were high school kids hanging out at independent record stores and attending sparsely filled concerts. The next minute they were meeting producer Rick Rubin in his New York University dorm room and hanging out with Run DMC. And despite some negative press about Russell Simmons during the recent “Me Too” movement, they credit him with their big break; somewhat surprising since he was both their manager and the co-owner of Def Jam records with Rubin. Def Jam stopped paying the Boys royalties for Licensed to Ill toward the end of their tour claiming they were in breech of contract for not recording a follow up album right away. The trio of rappers was once a punk band of 4 along with a female drummer, Kate Schellenbach who went on to form Luscious Jackson in the 90’s. Both Diamond and Horovitz expressed regret for kicking Kate out of their band because Rubin and Simmons didn’t think she fit with the new image that they were creating for the Boys. They also showed regret for many of the inappropriate and misogynistic lyrics on Licensed to Ill. Horovitz said that one of the questions that they received on the book tour earlier in the year was asking about Yauch’s lyrics on “Sure Shot” from 1994’s Ill Communication. “I want to say a little something that’s long overdue, The disrespect to women has got to be through. To all the mothers and the sisters and the wives and friends, I want to offer my love and respect to the end.” I guess if Horovitz can be married to Kathleen Hanna of Bikini Kill, then we can forgive them now too. They shared their ups and downs of their first album which they said started as a joke. They compared License to Ill and specifically “Fight for your Right to Party” to the combination of a drunk frat guy, a hair- mettle dude and the Three Stooges. “We became the people that we were making fun of,” Horovitz explained. The trio was completely burnt out after touring but after about a yearlong separation, eventually moved into a rented house in the Hollywood Hills to make Paul’s Boutique. This was after signing with Capitol Records, and a new manager who also represented Lionel Richie and Kenny Rodgers. They also realized that Capitol was more concerned with promoting Donnie Osmond’s new album than Paul’s Boutique. The band was broke financially after that. There were a few situations that were reenacted by an unknown young girl, who I assume must be the daughter of someone from the production, and actor Tim Medows. This might explain why some of the scenarios reminded me of something out of The Goldbergs. One brief scene depicted when Diamond met Bob Dylan for the first time at Dolly Parton’s birthday party dressed in the types of 70’s fashion that Pauls’ Boutique was famous for. Jonah Hill, one of the show’s producers, played one of the hidden MC’s along with Jonze himself who announced some directions over the loud speaker. Even though they seemed to rush though the ’90s through the present day, it’s hard to think about the music of the Beastie Boys before computers. They pioneered the use of technology with the Dust Brothers in the early ’90s. We didn’t walk out of a “concert” that night but we left feeling like we made two new friends who opened their lives and hearts to us for over 3 hours. Without our phones for all that time it really did feel like we were teens back in the ’80s.